Dave Harrell in action at Bewdley in the winter. WHO could wish for a more idyllic setting to fish a river than that provided in the centre of Bewdley? The middle Severn here is wide and swift with some deeper holes to explore and the prospect of a bumper session is always on the cards whatever time of year. The only downside in recent years has been the excessive flooding which has wreaked havoc locally and killed the fishing for extended spells. The best advice for gaining a satisfying day’s fishing in the warmer months is to fish either early or late. The middle part of the day on a low, clear river can be a waste of effort, and you may be better of going for a ride on the local steam railway or taking the kids to the nearby safari park where’ll you’ll see far more ‘creatures’ than you probably would encounter on the river! 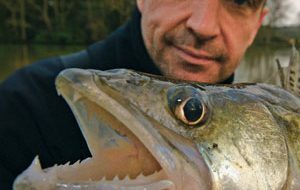 However, an early start or a late finish offers the chance to get among some fabulous fish such as the barbel for which the river is famed. There are also stacks of quality roach, chub, and dace waiting for bait and it is noticeable that the water is fishing better this year than ever. There are lots of pegs to try and the key methods are feeder and stick float in the main with waggler also well suited to the river. Double figure bags of small fish are also possible on the whip. The key tackle strengths are upwards of 6lb line for the barbel and around 2-3 lb for chub. Smaller fish are everywhere in the river and can be caught all day long on maggots. For the bigger fish meat, corn, caster and hemp are the key baits and you need plenty of casters and hemp to encourage the barbel in particular to switch on to your feeding. Summer action from the Bewdley festival. These days big single hook baits like meatballs and big chunks of meat are what’s required to tempt the barbel, which are usually big fish from 6 lb to double figures. The river right in the town centre is full of smaller species in the main and you can fish all day on the stick float for 20lb of dace, chub, roach and perch. Traveling further up or downstream will see you discover a wealth of pegs and it’s best policy to ask in the tackle shop which particular swims are productive at any given time of the year. Try to locate more oxygenated water in the summer and you’ll find fish never too far away. The colder months sees more showing roach and chub on the river with particular emphasis on the roach, which can top 2lb quite commonly. Where exactly they go in summer is anyone’s guess. The upper reaches of the town lengths are deeper and this is where it is best to find the roach. 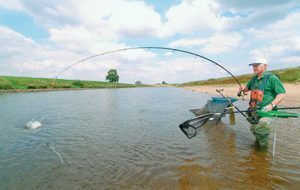 A long rod with a stick float is best suited to catching up to 20lb of prime redfins, predominantly coming on bronze maggots fished on a size 20 hook or maybe an 18 to 0.10mm hook lengths. It’s very pleasant sport when the river is spot on and carrying a little colour. The Severn still responds to bronze maggots. Local ace Dave Harrell dies his maggots with turmeric and says you can use it over and over again and that it takes only four hours for the dye to take. Day tickets: Some free fishing in the town. Matches: Local matches are held fairly often but with no set pattern. Contact local tackle shops for details. Facilities: Local town centre provides everything you need from accommodation to food. How to get there: Bewdley town centre lies on the B4194 just of the A456 about four miles from Kidderminster.